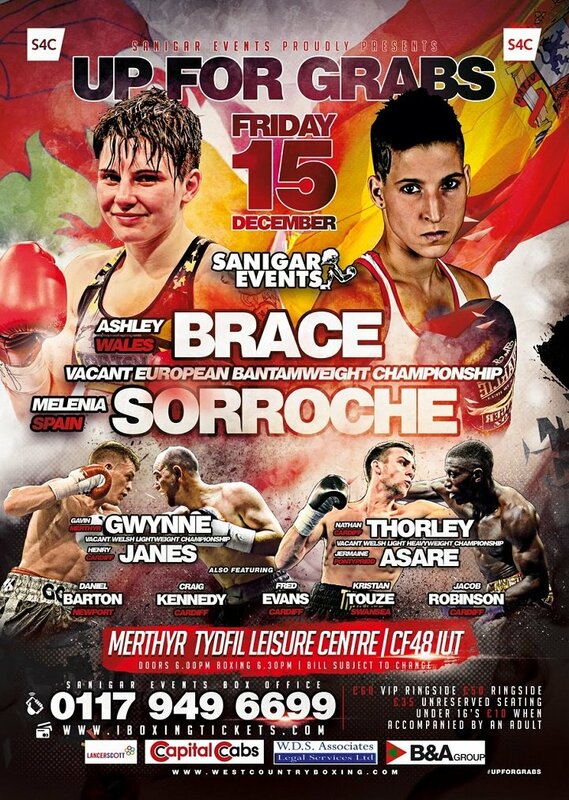 WBC International Female Bantamweight Champion Ashley Brace will challenge Spaniard Melania Sorroche for the vacant European Title at the Merthyr Leisure Centre on Friday December 15th. The contest was initially scheduled for 9th December but has been moved to not clash with Welsh World Champion who defends his title in London that evening. The event will be broadcast live on S4C headlined by Brace who is undefeated in 7 fights since turning professional in 2015 and has fast tracked her way to the top with several impressive performances, most notably a TKO victory in April over Alexandra Vlajk to claim the WBC International title. Sorroche will provide the toughest test of Ashley’s career so far. Her record stands at 13 wins with just 2 defeats and 1 draw and last year she lost a narrow split decision in challenging for the WBA World Title. Capturing the European title would put either boxer in prime position to challenge the WBC World Champion Yazmin Rivas in 2018. The first of our two Welsh Title fights features undefeated lightweight prospect Gavin Gwynne from Merthyr challenging Cardiff’s Henry Janes for the vacant Welsh Lightweight Championship. Janes is on a strong run of form and has taken the scalps of three undefeated prospects in the past year including fellow Welshman Jason Sillet. Janes’ last contest was a closely fought encounter with ‘Genius’ Joe Murray away from home in Manchester. He has mixed at a much higher level than Gwynne having shared the ring with former World Title challenger Kevin Mitchell and British Champions Martin Lindsay and John Simpson. The second Welsh Title fight features Cardiff’s Nathan Thorley against Pontypridd’s Jermaine Asare for the vacant Welsh Light Heavyweight title. Both Welshman were standout amateurs for Wales both winning bronze medals at Commonwealth Games, Asare winning in Delhi back in 2010 and Thorley in Glasgow 2014. Thorley has a perfect professional record with eight straight wins with four KO’s. Asare who has secured seven wins out of nine contests is scheduled to box in a four round warm up contest on 16th November in London after suffering a loss last time out to unbeaten prospect Malik ZInad. The undercard will feature Cardiff’s Craig Kennedy who will be looking to bounce back after an unsuccessful challenge for the British title back in May. London 2012 Olympic Silver medallist Fred Evans will be looking to secure his third pro win. Undefeated prospects Daniel Barton from Newport and Swansea’s Kristian Touze also feature along with the pro debut of Jacob Robinson the son of former World Champion Steve Robinson. Tickets are available on from the box office on 0117 949 6699 or ordered online at www.iboxingtickets.com priced at £60 VIP Ringside, £50 Ringside, £35 Unreserved Seating. Under 16’s £10 accompanied by an adult. Next boxing news: Will Deontay Wilder have to face the winner of Dominic Breazeale-Eric Molina if he gets through Stiverne return?